In this chapter we introduce controlled invariant subspaces (which are also called (A, B)-invariant subspaces) and the concepts of controllability subspace and stabilizability subspace. The notion of controlled invariance is of fundamental importance in many of the feedback design problems that the reader will encounter in this book. We will apply these concepts to a number of basic feedback design problems, among which the problem of disturbance decoupling by state feedback. 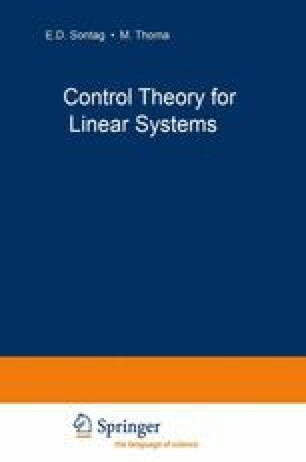 The design problems treated in this chapter have in common that the entire state vector of the control system is assumed to be available for control purposes, and we confine ourselves to the design of static state feedback control laws. Dynamic feedback will be discussed in chapter 6.